Northern Iron and Machine has two high capacity automated molding lines. Both produce green sand molds using a pattern, a containment vessel, pressure and high quality green sand. The green sand is comprised of silica sand and Bentonite clay premix which serves as a binding agent. Green denotes the presence of moisture in the sand. Strict process controls insure that the composition and moisture content of the green sand is kept within defined limits. For highest quality, the mold is not dried or baked. The green sand casting process packs sand into a flask that surrounds a positive impression of the casting to be produced. This positive impression is known as a pattern. 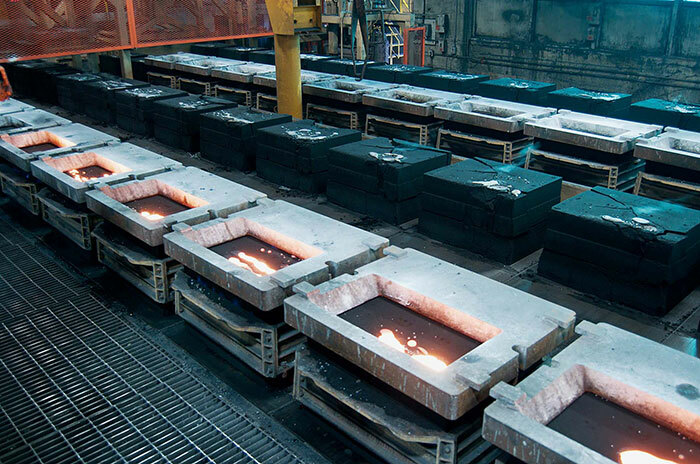 It includes runners, gates and risers that distribute the molten metal when pouring begins. The pattern is made from a durable material and built to exacting tolerances. The rectangular or square compacted sand container, with the negative impression of the casting and various runners, is known as a mold. The mold is manufactured in two halves known as the cope and drag. While the cope and drag are separate components of the mold, filters, exothermic risers, and cores are added to the drag side of the mold. Then the cope is rotated downward facing and the drag is positioned beneath it so that the two halves of the mold can be placed together for pouring. This process may vary depending on the equipment used. 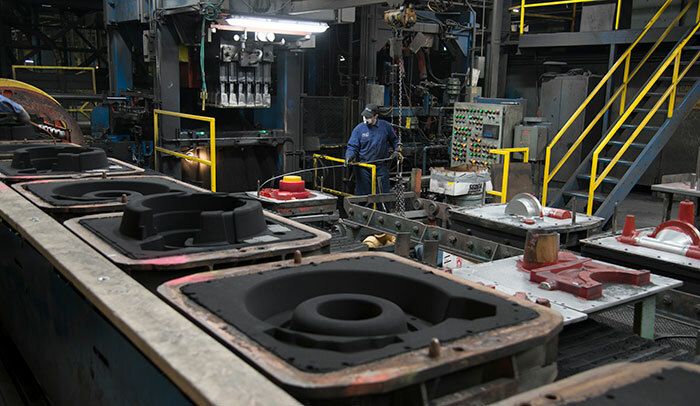 In some cases, castings may require a core be placed in the mold before closing. Cores are hardened pieces of sand specially shaped to form the internal surfaces or complex external surfaces of the iron casting and are produced using different processes. 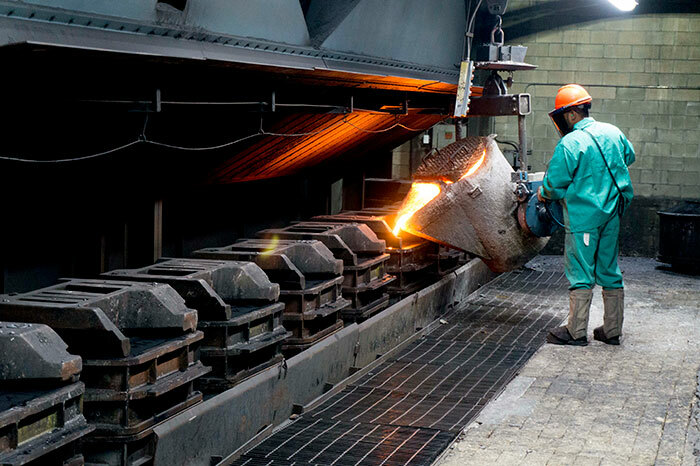 Prior to pouring the molten material, a large weight is placed on top of the mold. 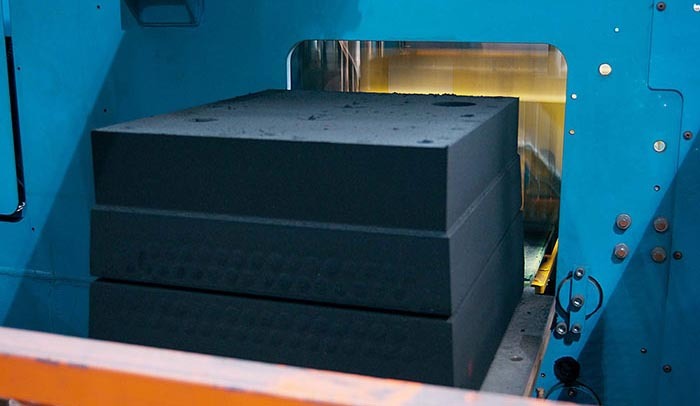 This prevents the buoyant force of incoming molten material from separating the cope from the drag side of the mold. Northern Iron’s largest molding line is an Osborne 30 square line. It has mold flasks that measure 30 x 30 x 12 inches deep. The pattern for it are mounted on two separate plates. The top flask is called the cope and the bottom half is called the drag. Northern Iron’s newest molding line is Disa system which uses a match plate pattern and produces molds that measure 20 x 24 x 8 inches. With match plate patterns, the two halves of the pattern are mounted on opposite sides of the same plate. Using this match plate pattern, the Disa system makes both halves of the mold simultaneously.